Explore, Learn, Have Fun! : My lunch with Paula Deen.. 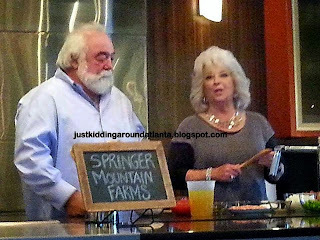 I was invited to attend a luncheon with Paula Deen and her husband Michael Groover in Atlanta, sponsored by Springer Mountain Farms Chicken. I will tell you right from the start - that is the ONLY chicken I buy! I tried it last year and we were hooked. DELISH. So I was very excited to attend! When we (rode down with another local blogging friend) arrived at Guy Gunter Home Showroom in Atlanta, they had a gorgeous luncheon set up for us. Guy Gunter Home is a kitchen, bath and outdoor living consultancy in Atlanta. What a perfect place for our luncheon! 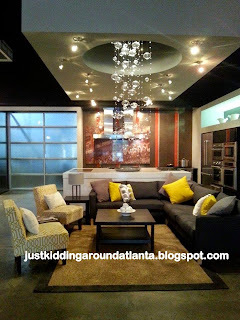 It's a wonderful showroom to visit if you are going to do a renovation or update in your home. 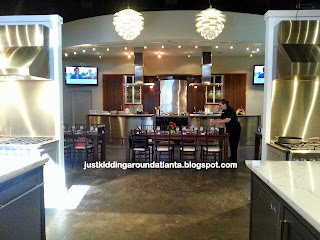 They have some really cool appliances and fixtures. 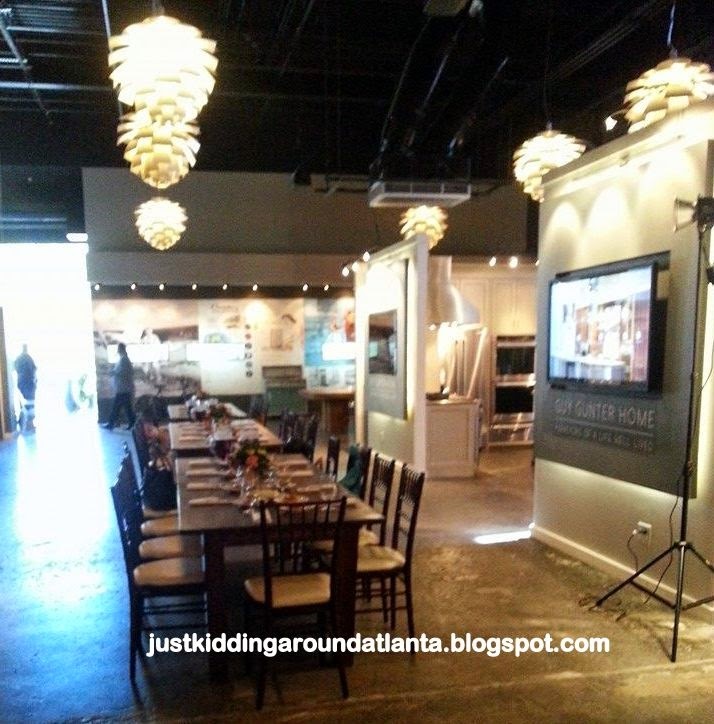 I had a great time exploring the showroom while we waited for the guest of honor to arrive! Then Paula Deen walked in the front door. Michael was with her and he is just as kind and down to earth as she is. Paula is teeny-tiny and she is stunning in person. She has the most beautiful blue eyes! First she talked with us (a group of local bloggers) about her brand new network - www.Pauladeen.com, and shared a very funny video clip with us. As a member, you can watch shows, search for recipes, utilize the meal planner and much more! You can get a free trial to check it all out, too. Next she made a delicious Chicken and Sausage Jambalaya for us, using fresh Springer Mountain Farms chicken. It was spicy, warm and delicious. This was my first time trying jambalaya, but trust me - it won't be the last! I plan to make this often! In a large skillet with lid, heat the oil and butter over medium-high heat. Add the sausage, cook until browned on both sides. Set aside in a bowl. Add onion and pepper to skillet, cook until softens a bit. Lightly sprinkle the chicken all over with salt and pepper. Add the chicken and garlic to the skillet. Cook until it loses raw color. Add the thyme, paprika, cayenne pepper, celery seeds, and bay leaves. Cook for a minute, then add the broth and tomatoes. Bring to a boil and taste for seasoning. 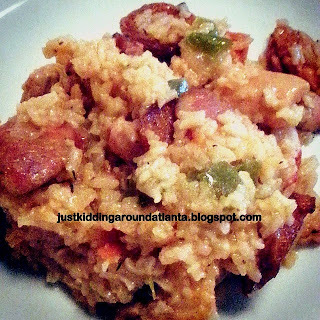 Return the sausage to the pan with any accumulated juices and sprinkle in the rice, evenly. Cover the pan, reduce heat to low, and cook until all the liquid has been absorbed and rice is tender, at least 15 minutes. Remove and discard bay leaves. Serve from skillet - delicious! 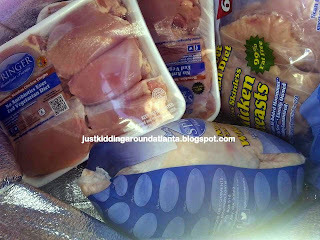 You have to try Springer Mountain Farms Chicken, if it is available in your area! Once you do, I bet you will be like me, and become a loyal customer of theirs! The camera on my phone is usually awesome for taking picures for JKAA. I have gotten some great pics using it! Because of that, I don't even bring my digital camera anymore. But for some reason yesterday, as the event went on, my camera went on the fritz. 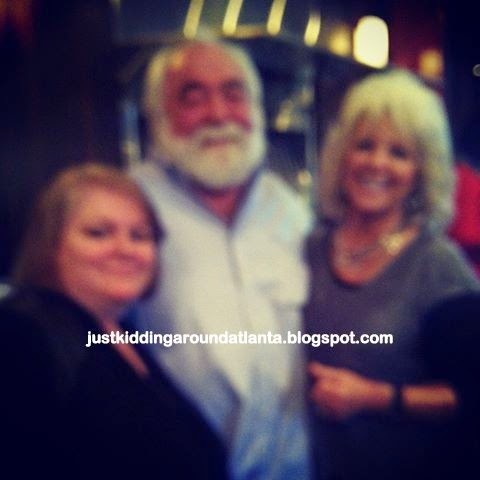 I didn't notice until I was in the car afterwards, how blurry my Paula & Michael pic was. Another blogger snapped it as well as 3 more, but they all are the same. (I did get a good one with Michael at least!) So please forgive the awful quality of some of these pics, they are all I have. 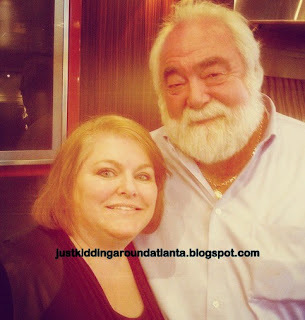 Well, except for priceless memories of a wonderful afternoon spent with Paula, Michael, and some really awesome Atlanta bloggers! So honored to have been included in this event. What a fabulous Monday! Oh, and check out my amazing "swag bag" from Springer Mountain Farms! It was a super-nice freezer bag filled with their yummy chicken! Happy girl here! If you are local, don't forget Paula's Live! Holiday Show this Sunday is at the Woodruff Arts Center. 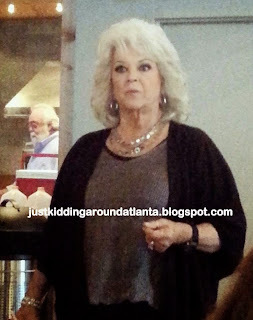 Please visit www.pauladeen.com to explore her new network. Finally, check out Springer Mountain Farms Chicken and on FB (link above) to learn why they have such delicious chicken! Thanks for letting me share this special afternoon with y'all, and check back soon for more giveaways! 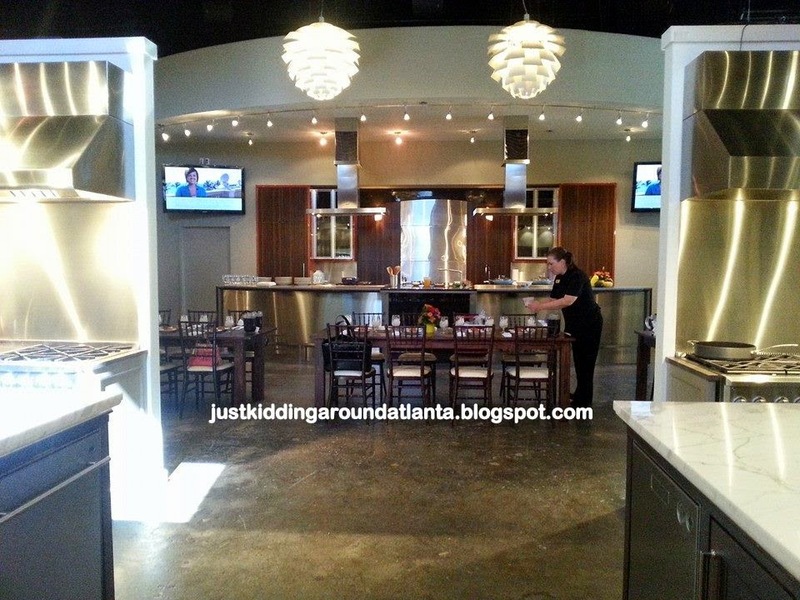 I was invited to this event so I could share Paula's Holiday show and network info with y'all. 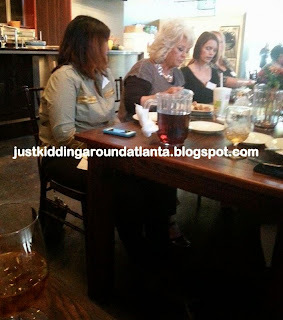 I attended the luncheon with Paula, plus received tickets to her upcoming Atlanta show (some for me, some to give away) as well as the chicken products from Springer Mountain Farms in exchange for writing this post and hosting the ticket giveaway. All opinions are honest, and my own!